Cereus jusbertii Rebut ex K.Schum. 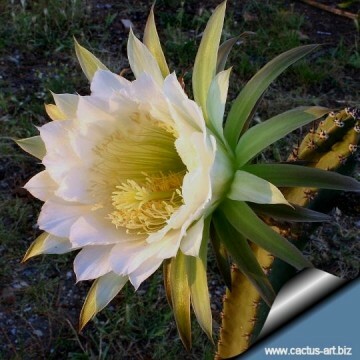 Harrisia jusberti is a night-blooming Cereus commonly known as "Queen of the night" It is a nice columnar cactus that produces huge nocturnal white flowers from spring to autumn. 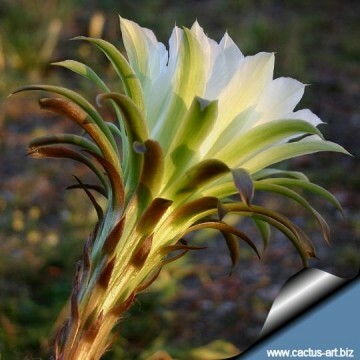 Origin and Habitat: Unknown, maybe Argentina or Paraguay. 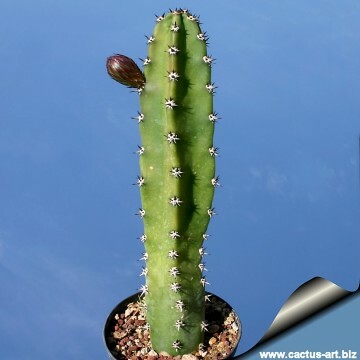 Description: Harrisia jusbertii is a columnar cactus, without aerial roots or segments, branching later, that forms small scrubs with few branches, mostly erect to sub-erect often requiring a stake or support from the surrounding. Stem: Dark green, up to 6 cm in diameter. Ribs: 4 to 6 fairly acute. Spines: About 7, very short more or less equal. 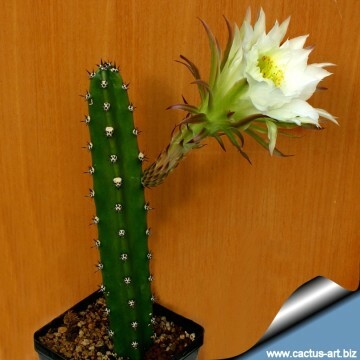 Flowers: Large up to18 cm long (or more) white, funnel-shaped, strongly scented, with brownish green outer petals,. Blooming season: This species produces abundant blossoms that open nocturnally from spring to autumn. Scales felty and hairy in the axil. Fruits: Fleshy tannish-green to yellowish-red at maturation with areoles, scales and short spines, pulp white . The fruits are rarely seen in cultivation, since the species is self-sterile, and most plants – even from different sources - might be coming from the same clone. 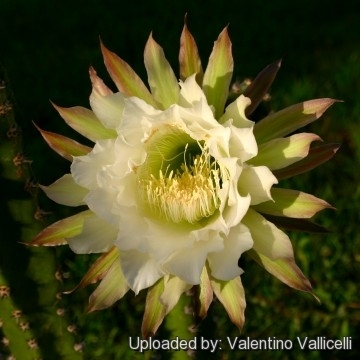 Remarks:Harrisia jusbertii is considered by some to possibly be a natural intergenic hybrid betweeHarrisia sp., probably Harrisia pomanensis, and Echinopsis eyriesii rather than a pure species. Notes: Harrisia bonplandii is not valid a synonym of this plant, it is instead a synonym of Harrisia pomanensis. 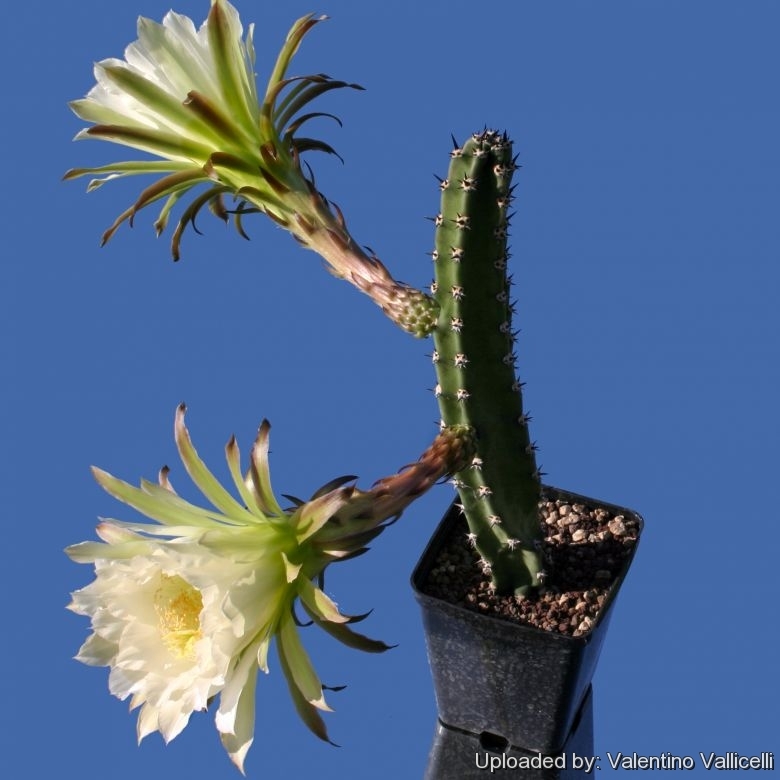 Cultivation and Propagation: This species presents no problems in cultivation and will do well in a sunny spot in a cactus house. Propagation: Harrisia jusbertii can be increased by seeds or cuttings. Cuttings of healthy shoots can be taken in the spring and summer, Cut the stem with a sharp, sterile knife just above a bud or shoot (a 7-10cm long tip or branch is most suitable for propagation) Leave the cutting in a warm, dry place for a week or weeks (depending on how thick the cutting is) until a callus forms over the wound. 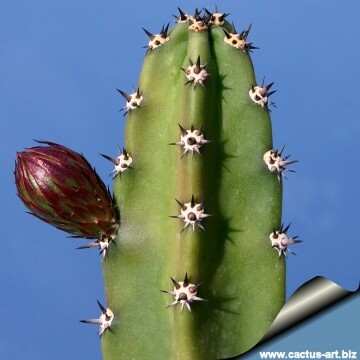 Once the callus forms, the cutting may be inserted into a container filled with firmed cactus potting mix topped with a surface layer of coarse grit. They should be placed in the coarse grit only; this prevents the cut end from becoming too wet and allows the roots to penetrate the rich compost underneath. The cuttings should root in 2 to 6 weeks. 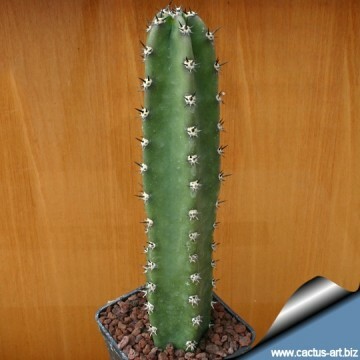 Uses: Harrisia jusbertii forms long columns that are great for grafting valuable species of cacti and - differently from other common grafting stock - don’t induces plants to elongate out of character and produce weak spination. The scions on Harrisia don’t grow as fast as the ones grafted on other tender and stronger stock, but they prosper very easy and can be kept in dark and cold places in winter. It can easily endure some light frost, too.